In 2010 a Gold Ring was found in Arizona. The markings on the Ring tell the story of the Egyptian discovery of America and the Biblical Flood of c.2344 BC. The discovery of America occurred in the Fourth Dynasty via the Bering Sea. All Atlantic Crossings were discovered in the Fifth Dynasty. The Flood was caused by a worldwide Comet Catastrophe in the Sixth Dynasty. It lasted for four months. 2.6 million people perished, which was 54% of the world population. The Ring dates from the 18th Dynasty. In the spring of 2010 a Gold Ring was found in the Grand Canyon in northern Arizona (fig.1).1,2 It has an engraving along its circular edge. Within this engraving are three markings one above the other. At both sides are deeper lying bulges of about equal size. The Ring was made in a rather primitive way, which testifies to great antiquity. It appears, that the face of the Ring symbolizes the North Atlantic Ocean (fig.2). The coast of the Old World is at the right side, and the coast of the New World is at the left side. The circular engraving appears to represent the coastal sailing route along the continents involved. Emphasis is laid upon the Northern Crossing. This longer marking may consist of a right half, and a left half (see fig.1). As a consequence, the face of the Ring might have four markings, in stead of three. It appears, the Ring is trying to tell a story. 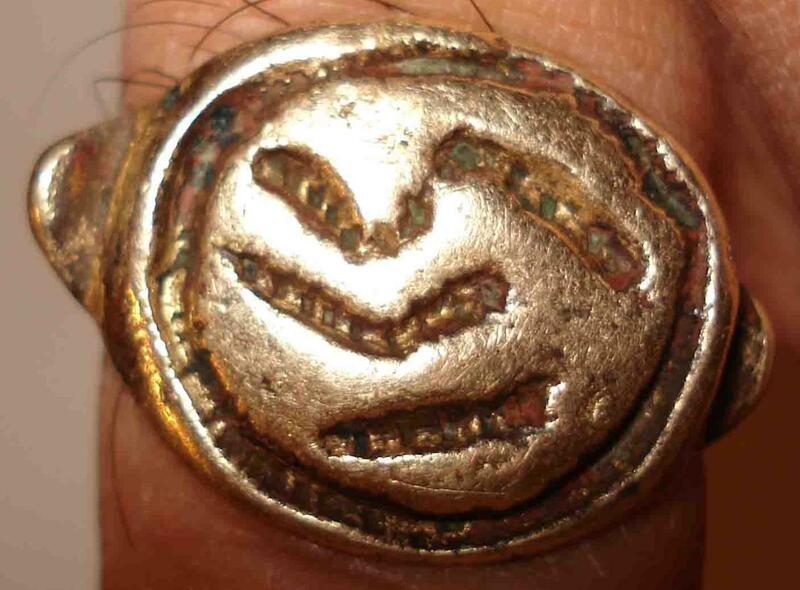 However, the face of the Ring represents the Atlantic, and the circular engraving also represents the Fifth Dynasty. The Southern Crossing is indicated by a single stroke, so it was discovered first. The Return Route via the Azores is indicated by two strokes, so it was discovered next. These two Crossings of the Atlantic were discovered by the 2nd king Sahura (c. 2510-2498 BC). The two strokes of the Return Route confirm it. The Northern Crossing consists of three strokes. So, it was discovered by the 3rd king Nefererkare (c.2498-2478 BC). It has 4 markings and a big circle, the 5th marking, confirming the 54% victims. The Ring was found in the Grand Canyon at about 36oN. The Grand Canyon symbolizes the huge force of water on the surface of the Earth. It corresponds to the circumference of the Earth, 36 Moiras, or 360o. It confirms it was a wordwide Catastrophe. The complementary latitude of 90o - 36o = 54oN confirms the percentage of casualties, 54%. Dating the Ring is not so easy. However, after some scrutiny it turns out that the right half of the upper marking has a wide and deep first part (fig.1). Counted from the bottom it is the third marking. It means the Ring dates from the New Kingdom, because it was the third time period in Egyptian history with good government and prosperity. The first part of the marking suggests the 18th Dynasty, because it was the first dynasty of the New Kingdom. The wide and smooth first part represents the sailing route from North Scotland, at 58oN, to NW Iceland, at 66oN. This is a latitude difference of 66o - 58o = 8o. As mentioned before, the Ring shows a total of 9 units. It corresponds to the latitude of the North Pole, at 90oN. It symbolizes the cold weather after the Flood, which lasted for centuries. It means, that each unit corresponds with 90o/9 = 10o, or 10 moiras. It confirms, the Gold Ring was made in the 10 + 8 = 18th Dynasty of Egypt (1580-1314 BC). The whole stroke represents the sailing route from North Scotland, at 58oN, to East Greenland at the holy Arctic Circle, at 67oN. This is a latitude difference of 67o - 58o = 9o. The Ring shows a total of 9 units. It confirms, again, the Gold Ring was made in the 9 + 9 = 18th Dynasty of Egypt. The face of the Ring shows the most important Crossings of the Atlantic. It means, the Ring was not made in America, but in the Old World. 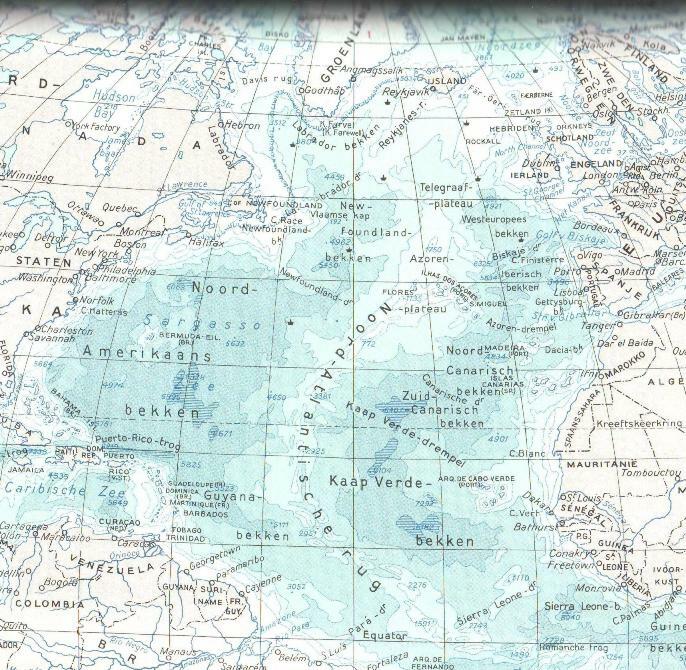 The Northern Crossing of the Ocean is emphasized, because it is the longest marking. The Return Route via the Azores is indicated towards Cape Finisterre, NW Spain, which is a northern destination. It appears, the Ring was made somewhere in Western Europe, probably NW Europe, but definitely not in the area around the Mediterranean Sea. 1. Steve Shaffer, personal communication. 4. De Jonge, R.M., and Wakefield, J.S., �The Discovery of the Atlantic Islands�, Ancient American, Vol.13, No.81, pgs.18-25 (2008). 6. De Jonge, R.M., �The Discovery of Three Continents (Santo Stefano, North Sardinia, Italy, c. 2300 BC)�, Ancient American, Vol.12, No.76, pgs.28-29 (2007), Ref.5. 7. De Jonge, R.M., �The Mystic Symbol, mark of the Michigan Mound Builders�, Ref.5, to be published. 8. De Jonge, R.M., �Houghton�s Petroglyph (Copper Country, Michigan, 2500-1200 BC)�, Ref.5, to be published. 11. Peiser, B.J., Palmer, T., Bailey, M.E., Natural Catastrophes during Bronze Age Civilizations, BAR International Series 728, Oxford, 1998 (ISBN 0-86054-916-X). 14. Courty, M.-A., �The Soil Record of an Exceptional Event at 4000 BP in the Middle East�, Ref.11, pgs.93-109. 15. Clube, S.V.M., and Napier, W.M., The Cosmic Serpent, Faber and Faber, London, 1982. 19. Grondine, E.P., Man and Impact in the Americas, Kempton, Illinois (2005) (ISBN 0- 9776-152-0-0). 31. De Jonge, R.M., The Phaistos Disc Decoded, New Testimony of a Lost Civilization, Mid- western Epigraphic Journal, Vol.20, 111-115 (2006), and Vol.21, 74-80 (2007), to be published.